The NDCX-II accelerator is specifically designed to study warm dense matter. By using an induction accelerator and a neutralized drift compression system, the ion pulse can be shaped to deliver most of its energy to the target surface. 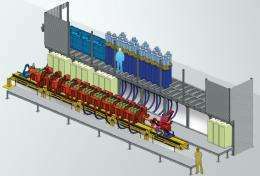 (PhysOrg.com) -- Berkeley Lab, a partner in the Heavy Ion Fusion Sciences Virtual National Laboratory (HIFS VNL) with Lawrence Livermore and the Princeton Plasma Physics Laboratory, has been a leader in developing a special kind of accelerator for experiments aimed at fusion power, called an induction accelerator. The induction principle is like a string of transformers with two windings, where the accelerator beam itself is the second winding. Induction accelerators can handle ions with suitable kinetic energy at higher currents (many more charged particles in the beam), much more efficiently than RF accelerators. Some of these challenges would be easier to meet if the target didnt have to be hit from both sides at once. 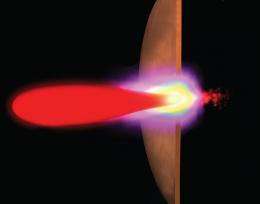 Researchers are encouraged by indications that target burning, hot enough to spark and sustain ignition, can be initiated with fewer beams illuminating the target from only one side. While investigating approaches to heavy-ion fusion, Berkeley Lab and its partners in the HIFS VNL are also tackling other scientific questions related to heating matter to high temperatures with ion beams. The current research program is designed to produce a state of matter thats on the way to fusion but not as hot  a state perhaps facetiously called warm dense matter, which is warm (10,000 degrees Kelvin or so) only by comparison to the millions of degrees typical of fusion reactions. Not a heavy-ion experiment, the Neutralized Drift Compression Experiment II (NDCX-II) instead uses an induction linear accelerator to accelerate and compress bunches of very light lithium ions to moderate energies. NDCX-II confronts a problem common to all accelerators, the space-charge problem, in which particles of the same charge  positive, in the case of atomic ions  repel each other; the bunches try to blow themselves up. For a given number of ions per bunch, this sets a lower limit on the pulse length. After acceleration in NDCX-II, the ion bunch enters a drift chamber where a plasma (consisting of ions plus numerous free electrons) is injected to neutralize the net charge of the pulse. A magnetic field focuses the bunch radially; meanwhile the induction accelerator has manipulated the ion velocity so that the rear end of the pulse catches up with the front end, compressing it longitudinally. In this way the pulse is shaped to deposit about three million electron volts of kinetic energy per ion, within one nanosecond duration, onto a spot just one millimeter in diameter on a thin foil target. The NCXX-II’s induction accelerator and neutralized drift compression system shape the ion pulse in such a way as to deposit about three million electron volts of kinetic energy per ion - the bulk of the energy - within one nanosecond duration, onto a spot just one millimeter in diameter on a thin aluminum foil. Construction of the NDCX-II accelerator began in 2009 and its first phase is expected to be completed early in 2012, when experiments will begin. The field of warm dense matter is an important research discipline in itself, necessary to understand the state of matter inside giant planets like Jupiter, and a variety of other astrophysical phenomena. Although its targets are thin foils, not heavy-hydrogen capsules, NDCX-II will make advances in acceleration, compression, and focusing of an intense ion beam, which will inform driver concepts for heavy-ion fusion energy production. Beams, targets, the architecture of reaction chambers, and the practical means of capturing the available energy from inertial-fusion reactions present a set of complex, interrelated problems that must be undertaken a step at a time. This might be a good alternative for proton-boron-11 fusion.